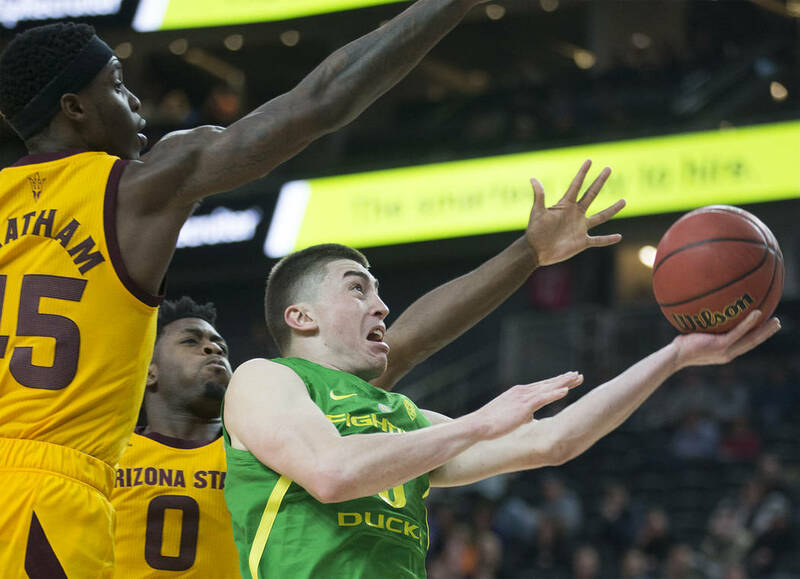 The Ducks — fresh off their Pac-12 conference tournament title run at T-Mobile Arena — quickly moved to 1-point favorites Sunday night over No. 5 seed Wisconsin after opening as 1½-point underdogs. When the opening lines on the NCAA Tournament were posted at Las Vegas sportsbooks late Sunday afternoon, not a single lower seed was favored over a higher seed. No. 12 seeds were swept in last year’s tournament but have historically been the go-to spot for picking an upset on your bracket. Over the past 11 years, No. 12 seeds are 20-24 straight up and 26-17-1 ATS. Salmons agrees with the line move and likes the Ducks to beat the Badgers. Certain teams are perceived as underdogs by the media and public but are betting favorites. Belmont (26-5), which won the Ohio Valley Conference tournament title, is a 3½-point favorite over the Owls in Tuesday’s game. Duke was awarded the No. 1 overall seed over fellow No. 1 seeds Virginia, North Carolina and Gonzaga. The Blue Devils have the easiest path to the Final Four in the East Region. Given a virtual clear path, Duke’s NCAA title odds improved to 2-1 on Sunday at the Westgate. Gonzaga moved from 4-1 to 5-1. North Carolina has been the hot futures team, moving from 12-1 a week ago to 6-1 on Sunday. Virginia is 8-1 and Salmons’ pick to win it all. “Looking through their region, Virginia has no excuses not to make the Final Four this year,” he said. Sharp bettors at Wynn Las Vegas backed Virginia as a 23½-point favorite over Gardner-Webb. Sharp money also moved Villanova from a 4½- to a 5½-point favorite over St. Mary’s and moved St. John’s from a 2-point to a 1-point underdog to Arizona State in Wednesday’s First Four game. One of handicapper Paul Stone’s tournament betting strategies is to wager against a public darling if the price is right. Stone (@PaulStoneSports) adhered to that strategy Sunday, when he wagered on Seton Hall as a 3-point underdog over Wofford (29-4), a popular mid-major. “Wofford plays in the Southern Conference and that’s a different level of play than what Seton Hall faced in the Big East,” Stone said. “Wofford is nationally-ranked and being hyped by media members and handicappers, too. But I think they’re overrated. Stone also played No. 13 seed UC Irvine (30-5) as a 6½-point underdog to No. 4 seed Kansas State. The line has since dipped to 5½.